Gateworks is a US based company that provides embedded hardware solutions to mobile and wireless communications markets such as their NXP i.MX6 powered Ventana single board computers, including Ventana GW5530 SBC with compact form factor making it suitable for robotics projects and drones. 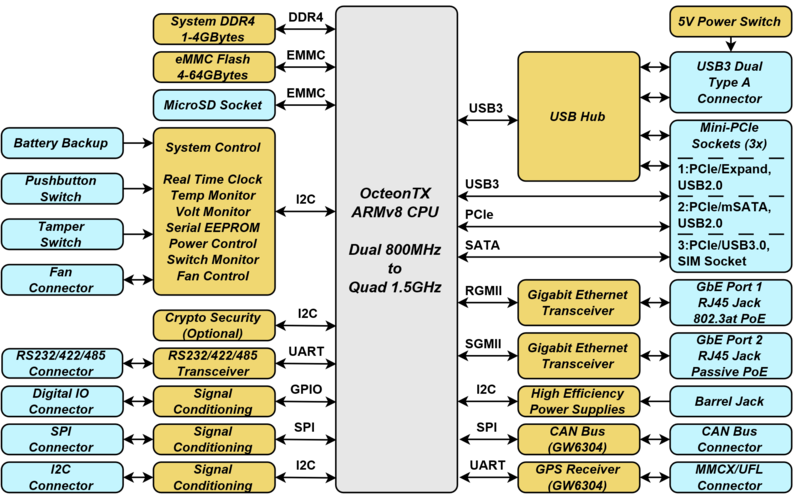 The company has now launched a new family of single board computers with Newport boards based on Cavium Octeon TX dual and quad core processors, and targeting high performance network applications with up to 5 GbE copper Ethernet ports, 2 SFP ports for fiber. GW6300 – 6W @ 25°C typ. GW6304 – 8W @ 25°C typ. The company provides OpenWrt and Ubuntu board support packages (BSP) for the boards. 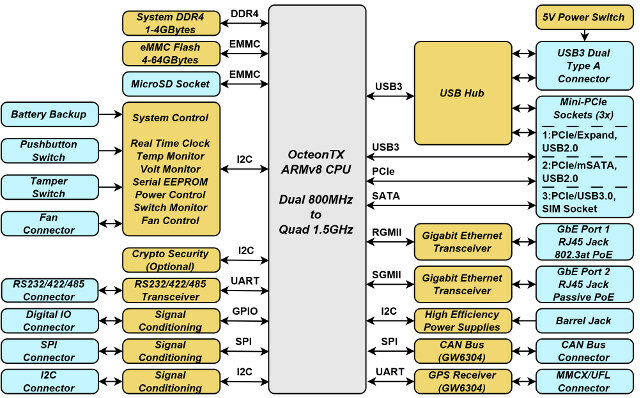 The company sells the board standalone, but also as a development kit (GW11042) with U-Boot bootloader, OpenWrt Linux BSP, Ethernet/ Serial/USB cables, passive PoE power injector and power supply, and a JTAG programmer. More technical details about software and hardware can be found in the Wiki. 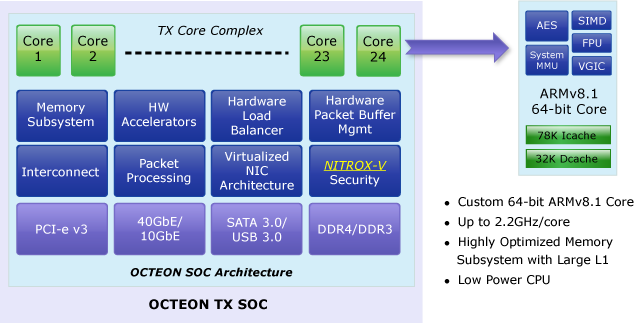 Octeon TX processors are specifically designed for networking applications, include networking acceleration engines & hardware virtualization, and can deliver IPSec performance of 8Gbps with only 2 cores. If Newport GW6300/GW6304 SBCs do not match your requirements, Gateworks have 6 more SBCs planned with different form factors and various combinations of Ethernet ports. As you can see from the table above, some boards are available now, with a rollout of other versions planned until Q2 2018. 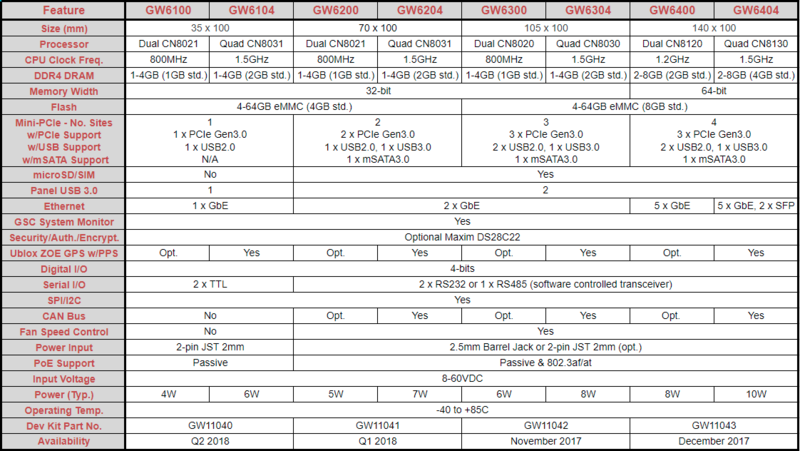 Price for GW6300/GW6304 boards is not publicly available, but you can request a quote, inquire for customization options, and find more details on the product page. I would rather stay away from Cavium CPUs. Last time I inquired about Gateworks ARMv7 CNS3420 based systems using Cavium chips. I found that I could buy those, but no Documentation, no SDK, no details of accelerators will be provided. I was supposed to plead Cavium directly for access. Cavium provides this info more readily to their top 6 Network OEM customers. The rest are just on their own. No support. Not friendly to mass-market.